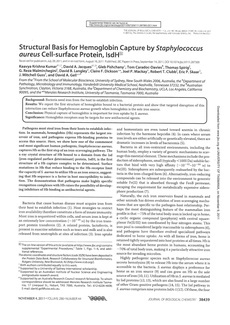 Copyright 2011 The American Society for Biochemistry and Molecular Biology, Inc.
Background: Bacteria need iron from the host to establish infection. Results: We report the first structure of hemoglobin bound to a bacterial protein and show that targeted disruption of this interaction can reduce Staphylococcus aureus growth when hemoglobin is the sole iron source. Conclusion: Physical capture of hemoglobin is important for iron uptake by S. aureus. Significance: Hemoglobin receptors may be targets for new antibacterial agents.